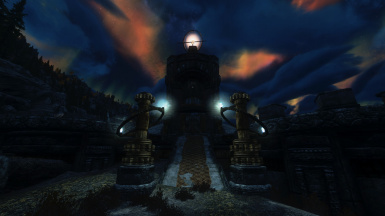 A Hircine-themed Dwemer dungeon, Katumz lies just north of Shor's Stone and was the seat of astronomical research. 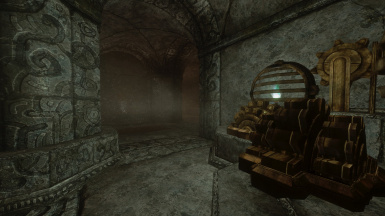 A mass of gears and pipes, the mod features a new ingredient and nine animated Dwemer weapons with unique enchantments. 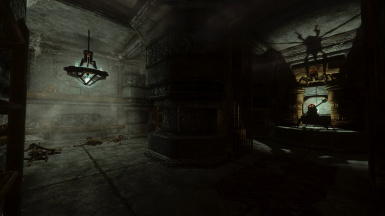 The Dwemer ruin lies north of Shor's Stone. To get inside, you need to find a key. 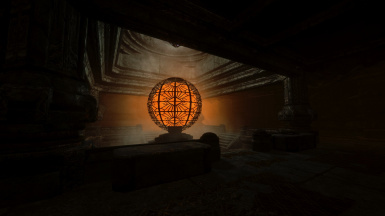 Try looking around areas near Dwemer experts (or looking at the pictures for a hint to one of three locations where the key might be found). 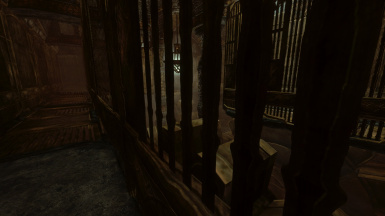 If you get stuck, check Articles for a walkthrough. 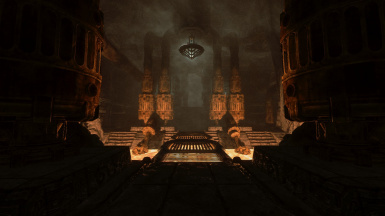 An estimated 1-hour-long lore-friendly dungeon. New weapons to mess around with. New ingredient. Bite into a citrus fruit! 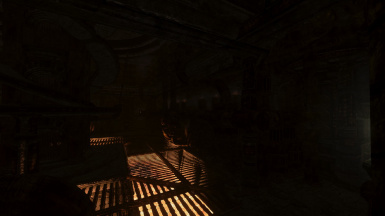 This mod might become or be incompatible with mods that change the landscape of the areas where Orange Moon takes place. Errors such as floating grass, landscapes with incorrect textures and height, and missing or duplicated static meshes may occur. Be particularly careful of mods that affect areas to the north of Shor's Stone. I highly recommend downloading an ENB shader as this mod centers around colors and darkness and, for this reason, I do not recommend a mod that removes interior fog. 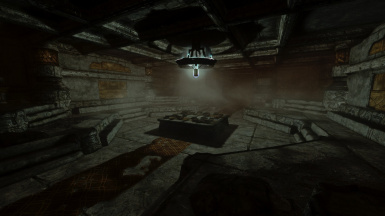 I feel that disabling fog or pushing it farther back can change or completely remove how the mod author wished the mise-en-scène of the level to be. Sometimes fog tells a story! The ENB I use is a tweaked version of SKYRIM ENHANCED SHADERS NLA - ENB and I have built Orange Moon around it. My only tweaks include simpler shadows and reflections as well as reflections for exteriors and interiors. 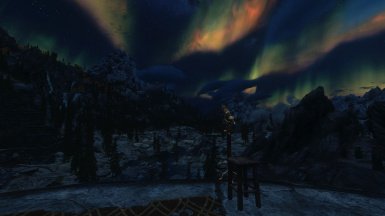 I personally believe it to be the best ENB on the market. The mods below are ones that I have personally endorsed. You may also wish to download my books mod as this will increase the number of books (located at the bottom of the page). Skyrim Misc Patches Collection - SMPC. Watercolor for ENB and Realistic Water Two. The LOD on the exterior ruin is not perfect. 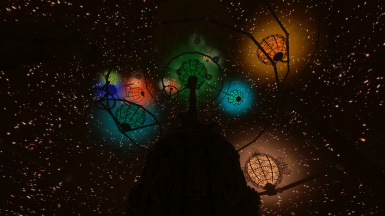 Some static meshes may disappear and reappear radically. The NavMesh bug. 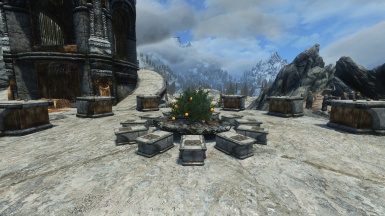 If you do not have Skyrim version 1.6.89.0.6 or above, the infamous NavMesh bug will rear its ugly head. There is no fix for this aside from a version update or tediously reloading the game every few cell transitions. Ambushes may not work correctly in that enemies will stand outside their hiding place. bfadragon for Resource Extra Food. elinen for Hoddminir Plants and Trees. mahty for Dwarven Beam Blades. Tamira for Stroti Resource Pack. tueffelachtein for Tueffels Misc Resources. wrig675 for Bellyaches New Dragon Species and Ohdaviing Replacer. 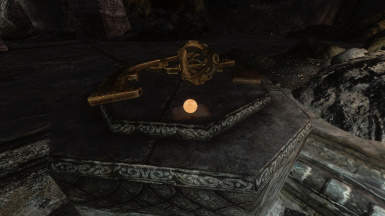 YarYulme for Old Dwemer Books.